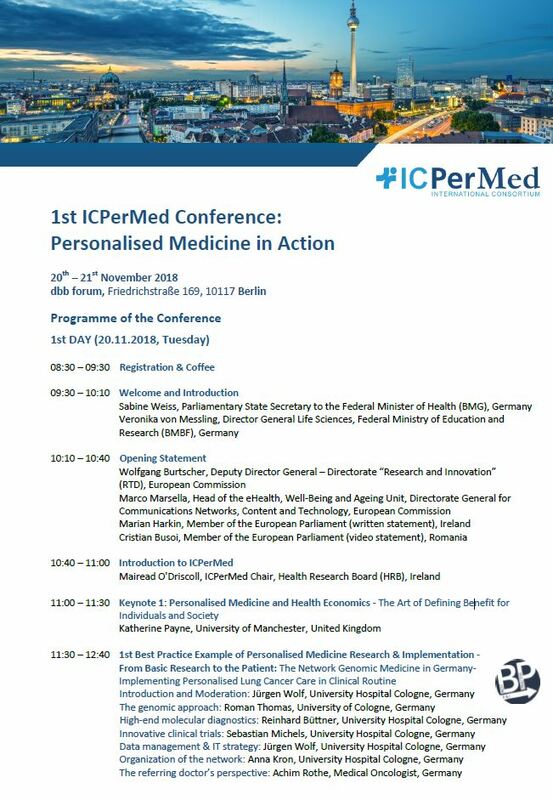 The first International Consortium for Personalised Medicine (ICPerMed) ‘Personalised Medicine in Action’ took place on 20-21 November 2018 in Berlin, Germany. The main focus of this conference was to present best practice examples of successful implementation of personalised medicine approaches. The Network Genomic Medicine (NGM) took part at the conference. The conference was organised by ICPerMed and supported by the European Commission, the German Federal Ministry of Education and Research and the German Federal Ministry of Health. You can find the videos and presentations from the conference here.